The long-running devil hunter series has popped out yet another DMC, but will this latest installment change anything from previous Devil May Cry's? Chop Chop Run, Chop Chop Run: This time around, the game doesn't star pretty boy devil hunter Dante, but instead makes you play as newcomer Nero. The story begins with Nero sitting in at a prayer meeting, but as the meeting comes to a closing, Dante crashes in and brutally assassinates the priest with his pistol. This is where you (Nero) steps in. The game then gives you a practical tutorial of the basic moves, and then has you battle against Dante. 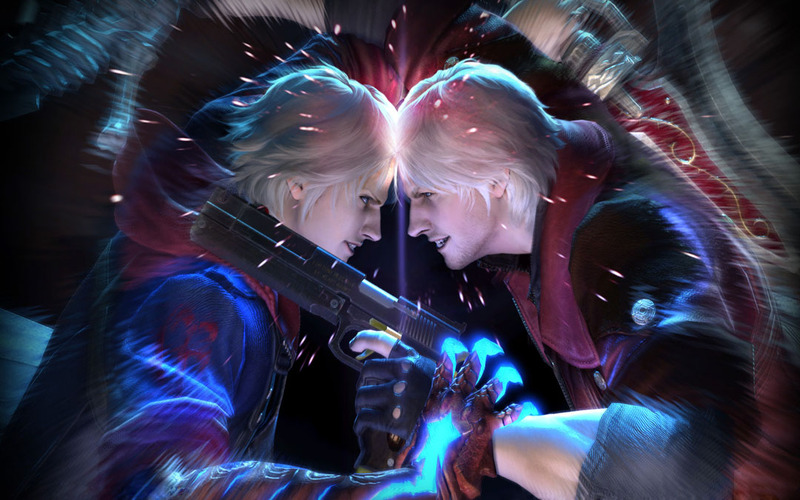 The first thing you will notice when you fight Dante is the fact that the game plays the same as DMC 3. That's where the biggest flaw comes into play. The latest DMC is nothing more then DMC 3 with wicked graphics. That's about it. Claim To Fame: The best thing about DMC 4 is the graphics, but Nero is a very interesting character that will keep your attention. Nero's greatest weapon is a demonic right arm called the Devil Bringer, with it you can grab enemies from a distance, inflict extra damage to those you are already holding and more. While the Devil Bringer is a great feature that will entice you to continue the story (also a strong point) it is overly powerful and can be used at anytime. In fact, you are overly powerful (as always) and you will be able to wade through wave after wave of mindless morons with ease. You Again: By far DMC 4s greatest downfall is the over whelming repetitiveness. You will wade through millions of enemies per level, easily disposing them in a terrific (and highly enjoyable to watch) fashion. When you get to the boss battles, you will quickly learn their pattern and then destroy them in a matter of minutes. The biggest problem though is that you will often face the same boss up to three more times after you beat him the first time. They will return in another (or sometimes the same) level, with a barely upgraded but equally predictable arsenal. After you beat him for the third time, this pattern gets quite old, quite fast. Also, the "puzzles" that DMC 4 has added feel very similar to those of previous Devil May Cry's, and you won't have any trouble with them. If DMC 4 had a little more variety to the gameplay, this would be a vastly better game. Rent vs. Buy: The downfall of Devil May Cry 4 is the fact that the core gameplay of "kill this forty time over, then move onto boss" hasn't changed one bit. The biggest changes in DMC 4 from DMC 3 are the tremendous visuals and Nero and his overly beefed Devil Bringer. When Capcom decides to innovate with the Devil May Cry series, then you should check it out. Otherwise, this is strictly for Devil May Cry franchise lovers, not anyone who can stand to go without the latest remake of DMC 2.